My 49er game time setup. This year is the first time that I will not be at Johnny's for the Super Bowl since January 28, 1996, when the Dallas Cowboys played the Pittsburg Steelers. Jeana's New England Patriots had a 6-10 record for the 1995 season, and my 49ers lost the division championship game to Green Bay. My husband and I were die-hard 49er fans when I bought Johnny's, and we had no problem getting customers to rally around our team. Tommy is a third generation native San Franciscan, and I am a born and raised Californian and lived in the big city for a while during my childhood. My older brother, Bill, was a football and 49er fanatic and I think some of that rubbed off on me. 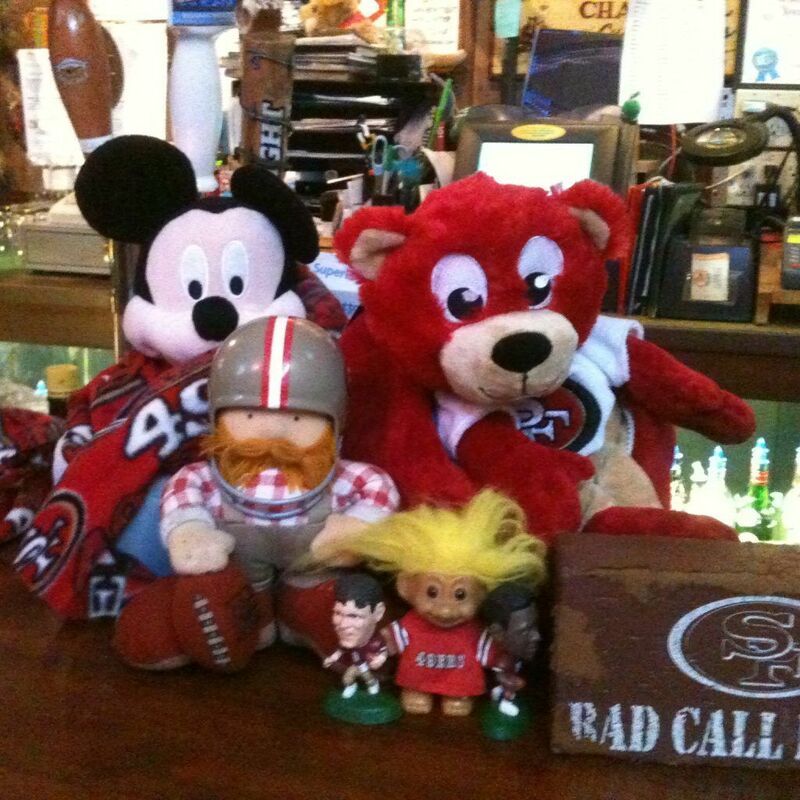 We had a mixture of 49er and Raider fans as regular customers at Johnny's, but our San Francisco team trumped all others. Our enthusiasm for the 49ers invigorated even the lukewarm football fans in town. We had the delight of seeing our team battle for a coveted spot in the Super Bowl for our first five football seasons as Johnny's owners. After losing the division championship to Tampa Bay in 2002, it was all downhill until 2011. Talk about a dry spell. We finally made it back to a conference championship game that year but lost it to N.Y. Giants. I was very disappointed but happy to have had a football season that I could enjoy once again. During the 49ers dry seasons Jeana's Patriots began their victory streak which gave me a team to root for. I've never even been to New England, but Jeana's enthusiasm for her team provided some of the 49er fans that loved her something to care about in postseason. My husband would not be one of those people. He couldn't stand Tom Brady and is still not a fan. I know football is a team game, but the addition of Brady to the Patriots is obviously what turned the team around. Statistics don't lie. I was sure that one day as Johnny's owner I would get to see my team win a Super Bowl. We got real close on February 3rd, 2013 when we played the Ravens. Sadly we experienced our first Super Bowl loss in franchise history. It was a wild game that we lost by one stinking field goal. I was devastated. There were so many records at stake, but the one that concerned me the most was my not experiencing a win as the owner of Johnny's. We had a couple more decent years in which the team kept my hopes of a Super Bowl win alive, but then we hit another awful slump. Anyone that knows me will tell you that I wasn't one of the unfaithful fans that deserted her team when they had a lousy win-loss ratio. I religiously got out all of my 49ers dolls, dogs, trolls, pom poms, and other team memorabilia for every game, until Kaperdink. I refuse to even say his name to this day. He ruined football for me from the time he kneeled during the National Anthem on September 1st of the 2016 season until about midway into last years season. I refused to watch football at all until the disrespectful jerks got off of their knees. I'm still so disgusted by the whole thing that I turn green when I think about it. So here I am, no longer Johnny's owner and Super Bowl 53 is being played tomorrow, February 3rd. How ironic is it that that's the same day that the Super Bowl was played on when my team lost to the Ravens. Sadly, I'm relegated to rooting for Jeana's team again. They are playing the LA Rams, and I refuse to root for our nemesis. I can't do it. Tommy can't root for Brady and the Pat's, and I can't root for the Rams. It will be a loud time at our house where close family is gathering to enjoy the game. For the first time in 23 years, I am preparing food for six, not sixty. It's a bit surreal. No more trying to come up with an excellent meal for my halftime customers. No more rushing to the bar from church to prepare the food. No more football pools, scheduling enough help and getting the food out so that I can enjoy the game. No more passing out earplugs to folks on either side of me. I'm sure Paddy will stay in our bedroom. I am incapable of quietly watching a football game no matter what team I'm rooting for. There was a time when I wondered if this day would ever come. God is good, and His timing is perfect. I walked away from Johnny's on April 1, 2018, and never looked back. I didn't get my 49er Super Bowl win as Johnny's owner, but I got to witness our San Francisco Giants win three World Series while there. They were epic good times in the place that I poured my heart and soul into for so many years. They are memories that I will always cherish. Enjoy the game folks, wherever you may be watching it. If it's a little loud in the Sunnyslope area, do not be concerned. It's just Tommy and me rooting for opposite teams. It only happens when Jeana's Pat's are in the game. There was that time the Falcons played the Broncos and Tommy, and his best friend, Seth, rooted for the Denver. What a wild one that was at Johnny's. That is another story for another day. After over twenty-two years I've got plenty of them. I hope you'll continue to follow along with me in my new life full of new adventures and new memories. With time to write, I can also share so many memories that didn't fit into my first book Born Again in a Biker Bar. It's available on Amazon, and if you email or message me, I can send you an autographed copy.